Denver, CO – It’s practically a rite of passage. 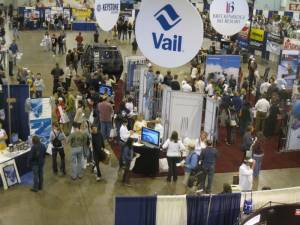 The siren’s song of deals on outdoor winter equipment, clothing, and accessories lures avid skiers and snowboarders annually to the Colorado Ski and Snowboard Expo. Celebrating its 25th anniversary this year from November 4-6 in Hall B of the Colorado Convention Center in downtown Denver, shoppers will find discounts up to 70 percent off gear from last season. Equipment such as skis, snowboards, and boots are the primary attraction but rack after rack of jackets, fleece, outerwear, under layers, helmets, gloves, kids clothing, and socks provide everything needed for a total upgrade to any ski slope ensemble. Admission is $15 for adults or $12 with a discount coupon available in The Denver Post or at any Colorado Ski & Golf or Colorado Ski & Sports store. Tickets can also be purchased online at www.skisnowexpo.com. Kids 12 and under are free. Retail therapy may be the bait but there is much more going on besides shopping. Dozens of resort representatives from throughout Colorado, the western United States and Canada are also on site with lift ticket and lodging offers, games, giveaways and loads of information about their resorts and lodging properties. Procrastinators can pick up season passes and discounted lift tickets throughout the weekend. New this year, the NFL is presenting the Flippenout Extreme Aerial Show. These world-class athletes perform synchronized gymnastic maneuvers on two trampolines separated by a transparent wall. These exhibitions are regular fan favorites during halftime shows for the NFL, NBA, NHL and many other sporting venues. Adjacent to the Flippenout performance area, the NFL exhibit area will showcase Denver Bronco products for sale, along with videos and interactive games inside the Expo, including Super Bowl film highlights celebrating 50+ years of The Big Game. For kids, it’s all about fun activities and play zones. Topping the list of favorites is the return of the high ropes course with plenty of obstacles to challenge participants on the airborne course that stretches above the Expo crowd. The SIA Nordic Village Interactive Zone returns with snowshoes and cross-country ski equipment for a dry land introduction to both sports for children and adults. Participants can also pump up their heart rate on the Ski Erg machine that offers a physical introduction to cross-country movements while the biathlon exhibit includes a laser rifle and target for those who want to test their aim while their heart is still beating fast. The Mountain Activity Center is anchored by the fast-paced and always crowded Purgatory Eliteam Training Center where a timed obstacle course provides a “snapshot” of kid’s basic fitness and flexibility. Kids can race the clock and their friends to compare results and attempt to improve their times. In the Slackers Slackline Competition and Demo Area, pros wow the crowds with their agility and tricky maneuvers on the wobbly cord. First-timers can even take a turn to test their skills and bounce-ability. Newcomers to the sport of skiing can visit the Winter Park Kids Snow Park Learning Center equipped with the gently pitched Kid’s Slope and staffed by instructors for an easy introduction to skiing. A climbing wall with two different routes to the top is always a magnet for future mountain climbers. Once again, Crested Butte Mountain Resort is sponsoring a mechanical bull so that children and adults can find their inner cowboy or cowgirl. After a full day of shopping and playing, adults can take a refreshing break with a cold brew while listening to live music in the Rocky Mountain Beer Garden. Expo hours are noon to 10 p.m. on Friday, Nov. 4; Saturday, Nov. 5 from 10 a.m. to 8 p.m.; and Sunday, Nov. 6 from 10 a.m. to 6 p.m.
Can’t wait! This’ll be the first time I’m in the states for the start of the season in over a decade. Sounds like this’ll be the best expo yet.